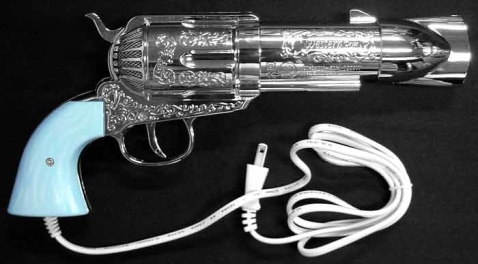 This Hairdryer is shaped like a revolver, and is creatively titled the “Western Hairdryer”. Place the barrel to your head, pull the trigger and you’ll be one more step closer to perfect locks. I envision something a bit more ironic; a suicide consisting of someone blow-drying his or her hair with this in a bath of champagne and Xanax. Sadly, it is only available in Japan and it costs about 40$, which is way too much for a hairdryer without a finger diffuser. Do you know where I could buy one from? I’ve found 1 Japanese site online and they are sold out! Thanks!